WXXI's Karen DeWitt reports that Gov. Andrew Cuomo and Republican challenger Marc Molinaro are trading barbs in recent campaign ads. The end of August used to be considered a slow season in politics, but television ads released by Gov. 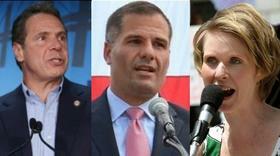 Andrew Cuomo and his Republican challenger, Marc Molinaro, are getting heated. Molinaro said Cuomo insulted his pregnant wife, while the governor’s campaign tried to bar the GOP candidate’s spot on state corruption from airing on television stations. Cuomo, who has far more money in his campaign account than Molinaro, employed the classic campaign tactic of trying to negatively define an unknown opponent to voters. In this case, the governor’s first campaign ad mentioning Molinaro links the Republican candidate to President Donald Trump, who is unpopular among many New Yorkers. Molinaro did not vote for Trump in 2016, and he has distanced himself from the president. He called out Facebook for violating the platform’s new rules against untruthful advertising by permitting the ad on its site. He said the ad is “blatantly false” and can be easily disproved with simple fact-checking. And he countered that Cuomo received $64,000 in campaign donations from Trump in past elections. The governor has said he won’t return the money. But the GOP candidate became truly enraged over an ad by the Cuomo campaign that began airing Tuesday. It links $5,000 in campaign donations to Molinaro from a construction company to tax breaks awarded to the firm by Dutchess County, where Molinaro is the county executive. The company, Tinkleman Brothers, also gave a job to Molinaro’s wife, Corinne. Molinaro, visibly angry, responded in a video. Molinaro said the Tinkleman Brothers contracts were competitively bid, and that his wife made just $27,000 for directing marketing for the company before leaving earlier this year after she became pregnant. She also wanted to devote more time to raising the couple’s three children, one of whom is disabled. Meanwhile, Molinaro’s campaign also has been producing some hard-hitting ads against Cuomo. The GOP candidate’s spot ties the governor to the recent corruption convictions of several former Cuomo associates on bribery and bid-rigging charges, including his former closest aide, Joe Percoco. Cuomo said the ad is untruthful because he has not been implicated in the latest investigation by federal prosecutors of a potential pay-to-play scandal involving a Hudson Valley health care company. Cuomo’s campaign manager sent a cease-and-desist letter to television stations, but many aired the ad anyway. The ad buy has now concluded. Before the general election officially begins, Cuomo first faces a primary challenge from actor Cynthia Nixon on Sept. 13. Nixon, running a campaign financed by small donations, has not purchased any TV ads. But she has released several videos on social media, including ones critiquing corruption in state government and the state’s policies on sexual harassment. The governor’s campaign has not aired any ads against the actor.